Where can I find my original Dignity Plan? Your Dignity Plan can be found in the My Account section, along with any new plans you may wish to create. Can I add to and edit my Dignity Plan? You will not be able add or edit your Dignity Plan, but you can create a new plan for you or a loved one using The Dignity Planner™ that includes options from your ceremony to flowers, music and reception options. Just choose CREATE A PLAN. The death of a loved one has occurred or is near. How can I obtain a copy of their funeral plan? If you are unable to access the plan details online, please call 866-581-5890. If a plan is available, a representative will assist in providing a copy to you and can also put you in touch with a funeral provider to help you with the next steps. Or, you can fill out our contact form online. Will I be able to go back to the original Dignity Planning site? No, the Dignity Planning® tool will no longer be available after June 1, 2017. We have transferred your plan summary and details (titled “Original Plan”) into your account at The Dignity Planner™. 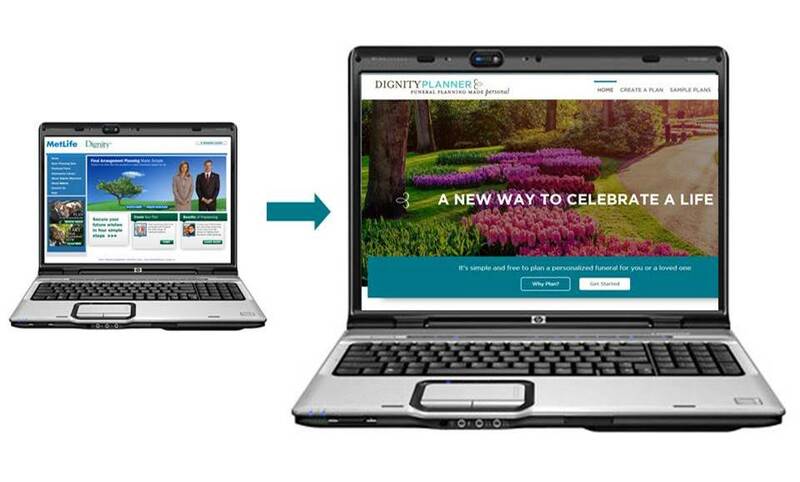 You will login to The Dignity Planner™ to view your Dignity Plan or create a new Plan for you or a loved one. Will I be able to do the same thing in The Dignity Planner™ as I did in Dignity Planning®? The concept is similar, but The Dignity Planner™ is a different planning tool than Dignity Planning®. You will still be able to give personalized directives on the type of service you want and identify a funeral service provider. The Dignity Planner™ provides a more robust experience to help you identify and record important details—such as the locations for visitation, ceremony, receptions and other. You can also give directives on music, catering and final resting place. You will be able to save, share and print your plan. You even have the option to create more than one plan, either for yourself or other family members. I am an Associate Member with questions or in need of assistance. The new Dignity Planner allows Members to directly email their plan details with any family member they wish. If you previously logged in as an Associate Member, or you received an Associate Member letter with login information please note this function it is no longer applicable. Your loved one is now able to directly share their plan details with you if they wish – either by email or by printing out the plan details to share and save. As before, we do encourage you to consider creating your own free personal plan to also share with family and friends. If you need immediate access to a loved one’s online funeral plan because a death has occurred or for any other reasons, you can contact Dignity’s Customer Care team directly at 866-581-5890. The Customer Care team is available to assist 24 hours a day every day of the year and to help answer any additional questions you may have. To access your account, please enter the following details. You will then be prompted to create a new password. Even if you didn't provide an email before, that's OK! Please enter an email so we can match or setup a new account. If you don't have or remember your username, please just make sure you complete the fields below .